Inspiring track from Akala’s new album, The Thieves Banquet. Today marks 25 years since the army of apartheid South Africa was forced to start withdrawing from Angola after 13 years’ intervention in that country’s civil war, having been defeated in battle by a joint Angolan-Cuban force. Over the course of 1975-88, nearly 400,000 Cubans volunteered in Angola, mostly as soldiers but also as doctors, nurses, teachers and advisers. This is one of the greatest historical examples of revolutionary internationalism. When Nelson Mandela visited Cuba a year after his release from prison, he made an emotional speech in Havana in recognition of Cuba’s contribution to the liberation of southern Africa. That speech is sampled in this track. 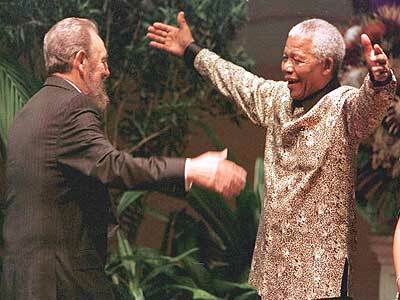 “This is revolutionary Cuba; internationalist Cuba; the country that has done so much for the peoples of Africa. The Cuban people hold a special place in the hearts of the people of Africa. The Cuban internationalists have made a contribution to African independence, freedom and justice unparalleled for its principled and selfless character. From its earliest days the Cuban Revolution has itself been a source of inspiration to all freedom-loving people. We admire the sacrifices of the Cuban people in maintaining their independence and sovereignty in the face of a vicious imperialist-orchestrated campaign to destroy the impressive gains made in the Cuban Revolution. “We knew – how could we not know! – that those events [in Angola] would have a profound effect on the life of South Africa itself, and this was one of the reasons, one of the motives, one of the great incentives that pushed us on. Because we knew that once the problem in Angola was resolved, the forces that were fighting against apartheid would also benefit from our struggles. “But have we said it this way before? No, never, because we believe that above and beyond the enormous support from abroad … the decisive and determining factor behind the ANC’s successes was the heroism, the spirit of sacrifice and struggle of the South African people led by the ANC. Please enjoy and share the track! Long live Cuba and long live free Africa! The legacy of Nelson Mandela lives forever! Militant ish from Marcel, produced by Agent of Change.